A Channel 4 documentary to be broadcast on Sunday 18 February will not only put Cheddar Gorge & Caves under the spotlight, but will also put a face to the name of Cheddar Man. A documentary, The First Brit: Secrets of the 10,000 Year Old Man, follows scientists as they help to deduce the facial appearance of Britain’s oldest complete skeleton, which was given the name Cheddar Man due to where it was originally found in Gough’s Cave over one hundred years ago. The film, which will exclusively unveil the face of Britain’s oldest complete skeleton, is scheduled to air as part of Channel 4’s critically-acclaimed Secret History strand. The 60-minute film follows the UK’s most ambitious and cutting edge Ancient DNA project to date. For the first time, a team of top scientists at the Natural History Museum and University College London have analysed the DNA of Britain’s oldest complete skeleton. Building on this advanced genetic testing of his 10,000-year-old bones, two of the most acclaimed palaeontological model makers in the world, Dutch identical twins Adrie and Alfons Kennis, have recreated his entire head to give this extraordinary skeleton a real identity for the first time. 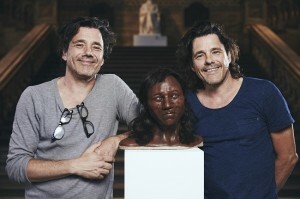 The Kennis brothers are experts in recreating animals and humans that are scientifically accurate with a focus on human evolution. 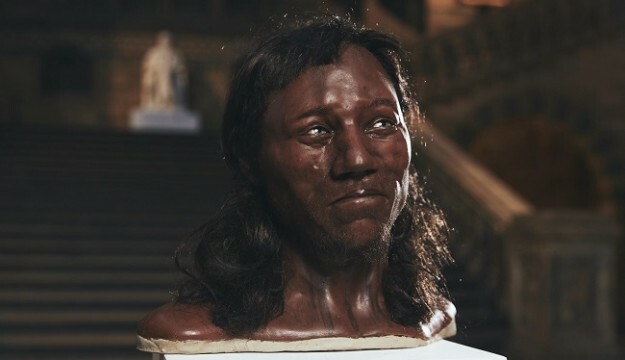 Through the combined efforts of the ground-breaking scientific research and accurate facial recreation, this TV exclusive will allow Britain to come face-to-face with the first inhabitant who we can directly connect to Britons today. Since his discovery in 1903, science has done its best to reveal Cheddar Man’s story. But key questions like what he looked like, where he came from and how he relates to us have been impossible to answer…until now. Leon Troake, operations manager at Cheddar Gorge & Caves, said: “The latest findings are fascinating. We now know so much more about this very special individual who lived in Cheddar Gorge 10,000 years ago. “To be able to completely reconstruct what Cheddar man looked like in so much detail from such a small amount of DNA is incredible. We now know so much more about his skin colour, hair, facial features and eye colour, which has not been possible until now. “Visitors to Gough’s Cave will now not only be able to see where Cheddar man was discovered but also have a good idea of what he looked like and imagine what life would have been like so long ago. “Hopefully this is just the start for the team involved in this research, and will allow them to expand their knowledge. We’re delighted to be playing a part in these historical findings,” he added. Cheddar Man’s skeletal remains are now kept on loan at the Natural History Museum in London, in the Human Evolution Gallery. They were excavated in 1903 in Gough’s Cave in Cheddar. Today, a replica of the skeleton is now exhibited in Gough’s Cave close to where it was discovered back in 1903. The death of Cheddar Man remains a mystery, although a hole in his skull suggests violence, and that the man may have also been suffering from a bone infection at the time.